Erica Weitzman’s research focuses on questions of ethics and aesthetics in the long nineteenth century. She received her Ph.D. in Comparative Literature from New York University in 2012. 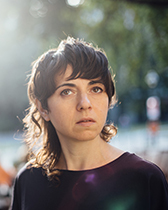 Prior to joining the Department of German at Northwestern University in 2014, she was a Visiting Assistant Professor in the Departments of German and Comparative Literature at the University of California, Berkeley from 2013–2014, and a Volkswagen Foundation Postdoctoral Fellow at the Universität Konstanz in the German Research Foundation (DFG) Graduiertenkolleg “Das Reale in der Kultur der Moderne” from 2012–2013. She has also been a doctoral fellow in the DFG-Graduiertenkolleg “Lebensformen und Lebenswissen” from 2008–2011. In 2017–2018 she is a visiting scholar at the Zentrum für Literatur- und Kulturforschung in Berlin, with a fellowship from the Alexander von Humboldt Foundation. Professor Weitzman’s first book, Irony’s Antics: Walser, Kafka, Roth, and the German Comic Tradition (Northwestern University Press, 2015), explores the role of the comic in early twentieth-century German literature and its roots in romantic irony’s challenge to idealist thinking. She also co-edited the collected volume Suspensionen. Über das Untote (Fink, 2015), whose essays consider aspects of “the undead” as a figure that destabilizes both the life/death binary and the epistemological regimes that it structures. Her current project, At the Limit of the Obscene: Realism, Profanation, Aesthetics, examines the concept of obscenity as a question of representation, perception, ontology, and affect in the context of the history of German realism from Stifter to Kafka. Teaching and research interests include: German-language literature, philosophy, and culture of the nineteenth and early twentieth centuries; realism and naturalism; critical theory, phenomenology, psychoanalysis; theories of irony, comedy, and humor; law and literature; fin de siècle and World War I; literatures of Mitteleuropa and Southeastern Europe. “Base Matter: Pathetic Fallacy in Gustav Freytag’s Soll und Haben,” Colloquia Germanica 47.3 (2014, published 2017), 37-62. “Ismail Kadare’s The File on H. and the Comedy of Epic,” Modern Language Review 3.3 (July 2016), 818-839. “‘Was bedeutet der Stein?’: Fetishism, Profanation, and Parody in Fontane’s Grete Minde,” Konturen 8 (2015), 71-98: http://journals.oregondigital.org/index.php/konturen/article/view/3706/3532. “Scham, oder die Metaphysik,” in Rücksendungen zu Jacques Derridas Die Postkarte. Ein essayistisches Glossar, ed. Matthias Schmidt (Turia + Kant, 2015), 329-340: http://www.turia.at/titel/aka_derr.php. “‘Ich bin nicht krank, ich bin ja tot’: Walsers kryogene Kunst,” in Suspensionen. Über das Untote, eds. Carolin Blumenberg, Alexandra Heimes, Erica Weitzman and Sophie Witt (Fink, 2015), 61-72. “Human Fragments: Plastic Surgery and Bare Life in Joseph Roth’s Feuilletons,” Journal of Austrian Studies 46.4 (Winter 2013), 87-109. “Odradek’s Laughter,” Journal of Cultural and Religious Theory 12.1 (Spring 2012), 31-36: http://www.jcrt.org/archives/12.1/weitzman.pdf. “Beyond the Legality Principle: Sacher-Masoch’s Economies of ‘Jewish Justice,’” Law and Literature 23.3 (Fall 2011), 442-470.